The loosely intertwined stories of Rothgar, the general who is the keeper of the magical amulet known as the Dragonscale, and Aristaria, an orphaned elf from the city of Revelnortk, are at the center of JE Feldman’s The Dragonscale novel. War is breaking out in the world called Arbedenion as the Vampires, led by their evil queen, Gicessa and her diabolical daughter, Valacotayda, join forces with the army of the Black Dragons to take control of the empire. After a ruthless victory that destroys Revelnortk, the vampires seem to have the upper hand, but Rothgar is determined to stop them with the aid of the dragons that he calls forth from the amulet and his plan to rally the races of Arbedenion to form a united front against the dark armies. Aristaria enters the war with the help of an old friend, the warlock Grevinmor, and manages to gather leaders and creatures to fight on the side of the elves along the way. Soon, all the beings of Arbedenion have chooses sides and send forth armies of dwarves, drows, unicorns and magidrows against the combined strength of vampires and Black Dragons. Rothgar and Aristaria both have major roles to play in the both outcome of the final battle and the fate of Arbedenion. First of all, I can’t get over the fact that this novel was written by JE Feldman when she was just 15 years old. Yes, it has a straightforward story line and seems to want to include every possible creature one might find in an epic fantasy novel, but the very fact that she manages to keep track of her cast of–maybe not a thousand, but at least several dozen—characters is a feat that most brand spanking new indie authors never accomplish. She also creates some truly interesting characters that I would like to see developed more in future books in the series (currently set as a trilogy). For one, the uber-evil vampire Valacotayda seems like a character who could have had a wider story told to round out her personality a bit. I found her fascinating and delightfully dark and look forward to more of her in future Arbedenion projects. Also high on my list of excellent things is Feldman’s dwarf kingdom. It seemed well thought out and fully realized. I found myself wanting more of the scenes in that kingdom as well as among the dwarven army. For me, the elves seemed to fill the spot that humans usually fill in a typical epic fantasy story. At first this caused me some concern and confusion as I’m used to reading elves who speak and behave very differently than the usual ‘farmer-slash-peasant who lives in a fantasy village’. But, this unique portrayal of elves proved to separate them from their usual ‘rarified’ depictions in both literature, genre and film, where they can almost always be counted on to step in and save the day in some glorious glow of light and obtuse language. I ended up quite enjoying Feldman’s elves, who came complete with their own set of heartbreak, foibles and petty behaviors. Although, it should be noted that this is the type of elf that might not appeal to everyone. Some readers VERY MUCH love their CGI-smoothed faced elves sitting around great tables in fantastic lands, speaking in florid sentences and generally looking down on anything that is not an elf. Feldman’s elves want to save the world, for better or worse, and are not afraid to show their emotions, whether it be happiness, fear or mindless screaming when things don’t go their way in wartime. One caveat: It is very, very difficult to create dragons who are both ancient and wise and elemental and fierce without having them end up speaking like Worf on the bridge of the Enterprise. Hats off to JE Feldman for writing her dragons as just another character in a very full roster of characters and using a natural speaking style for all. 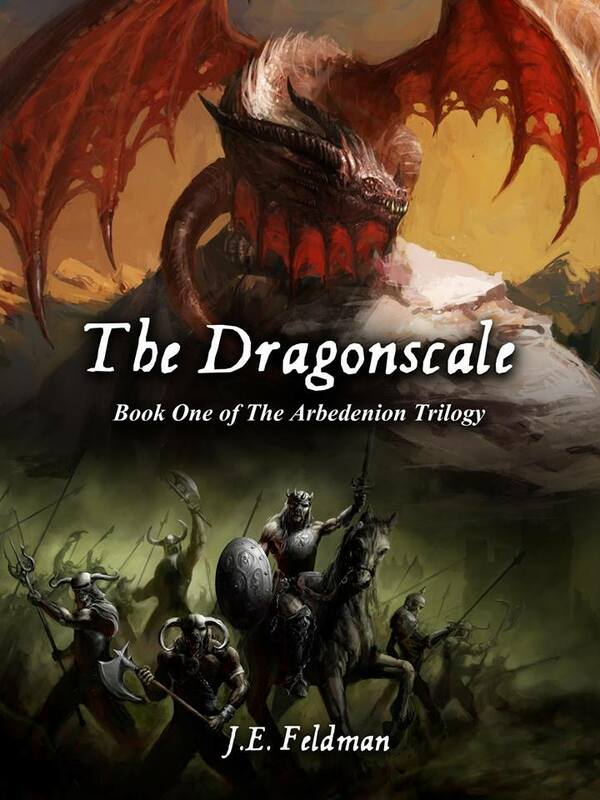 I very much enjoyed The Dragonscale and see it as rising above the crowded field of first time epic fantasy writers in both its scope and the amount of imagination put into building the complex world of Arbedenion. If this is any indication of where JE Feldman will be as her writing style grows and matures, I am very excited for the next offerings in the Arbedenion Trilogy! My very first story was written when I was 3. It was a small picture book about my grandma’s three little dogs meeting a whale and going on adventures. I still have it but I have never thought to publish it. One tip for successfully promoting a book? Word of mouth is the best way to do it. It gets your community excited and they naturally want to spread it. Before you know it, people in California, Canada, Europe, and Australia are wanting your books. What made you decide to write in your current genre? I didn’t decide to write in my current genre. I just write. It took me a while to figure out that I write in the Fantasy/Sci-Fi genre the most. I enjoy dabbling in Action/Adventure and Historical too. Thank you so much to Jasmine for such a fantastically detailed book review of “The Dragonscale.” I sincerely appreciate it!! I’m a bit sick of epic fantasies with done to death elements. For my own epic fantasy there are no elves, no dragons and no dwarves, but there are new species that fill the gap left by them. That being said, if an author can put a fresh spin on washed-out formulas – and get it to work effectively – then they’ve achieved something. With that in mind, I wouldn’t mind reading The Dragonscale as it sounds like I may enjoy it! On a side note, when it comes to dialogue I find GRR Martin extremely pedestrian, lacking in humour or wit, and quite tiresome, which makes authors such as Joe Abercrombie an absolute breath of fresh epic air. When an epic fantasy writer can inject their story with dialogue that tickles you, slaps you in the face and hauls you out of the window, rather than making you fall asleep, then they’ve done something right. Dialogue is key, ESPECIALLY in 21st century epic fantasy.